Calm and soothe your body and mind with the KIKI Health Sleep and Relax Bundle, a set of three health supplements which can be used alongside a healthy diet to reduce fatigue, support the metabolism and relieve anxiety and nausea. Increase the body’s magnesium levels with a simple spray that can be applied directly to skin. Utilising Genuine Zechstein™ Magnesium Mhloride, a naturally occurring ingredient found beneath the Earth’s crust, the saturated solution is fast absorbing and easily transported to cells, allowing the body to benefit quickly. Suitable for full body use, KIKI Health Magnesium Oil has an array of beneficial effects on the body, such as the reduction of fatigue, encouraging normal muscle function and maintaining healthy teeth and bones. Discover a multi-use supplement with a soybean-derived formula that delivers essential Lecithin to the body. Lecithin cannot be manufactured naturally by the body and so it is something that must be consumed within the diet. 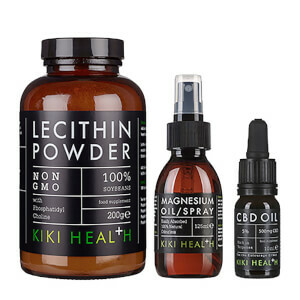 Lecithin is a natural fat emulsifier and is therefore ideal for improving moisture and texture whilst cooking, as well as transforming home-made beauty products. Once added to food, the powder functions as a thickener, stabiliser, moisturiser and a mild preservative. It also lends a creamier flavour to foods. Lecithin powder combines Choline and Inositol and is a necessary component of every cell in the human body. Consuming the Lecithin Powder Non-GMO contributes to a healthy metabolism and normal liver function. Treat ailments naturally with a lightweight vegetable-based oil enriched with a 5% concentration of Cannabidiol Oil extracted from the tops of fresh hemp plants, which is then mixed with Hemp Seed Oil. Unlike THC (the mind-altering component found in cannabis), CBD is the major non-psychoactive component of the plant that is linked to a growing list of medical benefits from calming anxiety to relieving nausea, pain and inflammation. Rich in terpenes (fragrant essential oils found in plants), the oil boasts a pleasant taste. Magnesium Oil: Apply 5 to 20 sprays to area of concern in the morning and at night and lightly massage into the skin. Ideally spray after a shower or bath to any area of the skin as the pores are open which aids better absorption. Lecithin: Adult intake: 1-2 tablespoons per day. Add to any drink or smoothie, sprinkle on/or mix with foods for an extra creamy flavour. If using as a thickening agent, allow 10 minutes for full thickness to take effect. CBD: Shake before use. Put 2 – 3 drops under the tongue 3 times a day and keep in your mouth for a minute before swallowing. Swallow after 90 seconds. Do not exceed 20 drops per day/in a 24-hour period. CBD Oil can also be mixed with water. Magnesium Oil: Purified Water, Genuine Zechstein® Magnesium Chloride (31% Magnesium Chloride) and other naturally occurring trace minerals. CBD: Hemp Seed Oil (60%), CBD (Cannabidiol) Full Plant Extract (40%).